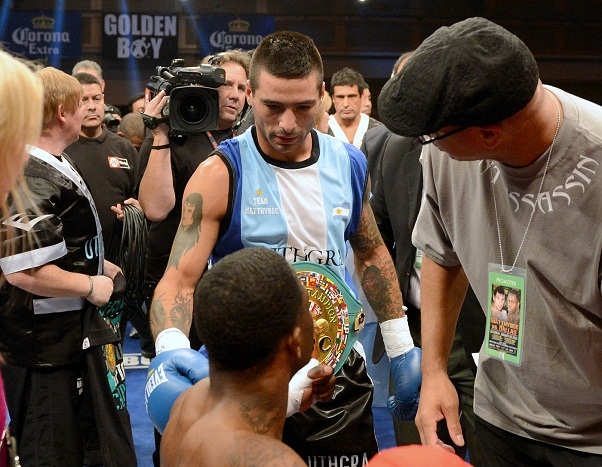 On Saturday, Jan. 26, inside of the Hard Rock Hotel and Casino in Las Vegas, Nevada, interim WBC junior welterweight champion Lucas Matthysse (33-2, 31 KO’s) made short work of Mike Dallas Jr., (19-3-1, 8 KO’s), chopping him down in under one round. After taking his time to study his opponent, Matthysse connected on Dallas with a thudding right hand and a follow-up left that had his 26-year old foe out on his face and unable to continue. Matthysse now looks towards bigger bounty, but it remains to be seen if the 30-year old Agentinean will get the bouts he desires most. For several months, Matthysse has called for a match with WBA/WBC champion Danny Garcia, who is presently scheduled for a Feb. 9 date against former champion Zab Judah. Catching up with WBA welterweight champion and Showtime analyst Paulie Malignaggi after the bout, I got his take on Matthysse’s victory and what his future may hold. Read below for some of Paulie’s thoughts.